Ancient manuscripts are priceless repositories of knowledge; many hold glimpses into the past and share their wisdom with those in the present. But, what would you do if the 2,000-year-old manuscript you were translating and reading addresses you personally? 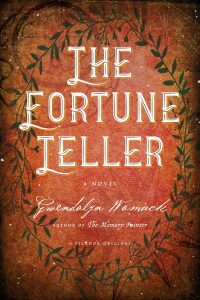 In Gwendolyn Womack’s The Fortune Teller, antiquities appraiser Semele Cavnow faces this dilemma when she is given the task of appraising a special collection in Switzerland for her prestigious auction house based in Manhattan. Semele thought that her assignment would distract her from her personal turmoil, not add to it. On the last day of her assignment, Semele finds a prophetic manuscript hidden by the previous owner with a letter inscribed to her. Unsure of what she found, Semele keeps this find hidden from her client Theo Bossard until she can discover more. Unbeknownst to Semele, the ancient manuscript has a very special connection to her and sets her on a whirlwind journey that transcends time and space. The Fortune Teller blends the elements of magic, mystery, and romance together seamlessly, while you follow a select lineage of women spanning thousands of years and watch how their personal histories impact Semele’s life, for better or for worse.